Appearance: Dark orange with evenly spaced legs. Nose: Burnt caramel, cedar, burnt orange. Palate: Full bodied and sweet. Maple sugar candy, chocolate orange, burn. Finish: Hot and chocolaty. Goes strong for a long time. 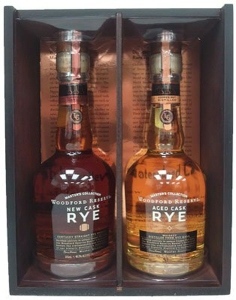 Parting words: This is the third rye Woodford Reserve has released, but the first wide release. 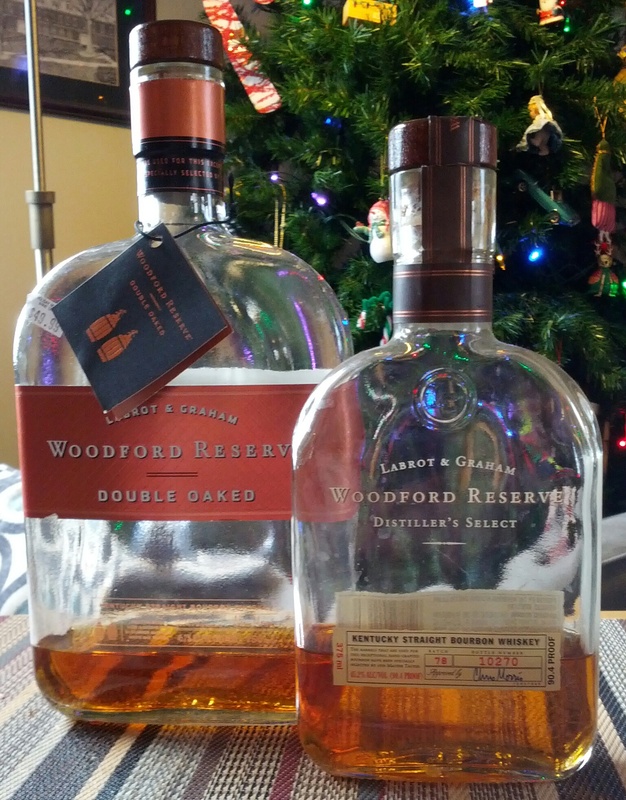 The first two were the Woodford Reserve Master’s Collection Rye whiskeys, both entirely distilled and aged at the beautiful Woodford campus (aka Labrot & Graham) in Versailles, south of Frankfort. They were released in a set of two 375 ml bottles in a decorative box. One was aged in used barrels, another in a new charred barrel. I liked them both, but I’m in the minority. I reviewed it here on the shores of Walloon Lake in Northern Michigan, with the help of friends-of-the-blog (and sisters) Amy and Jennifer. This whiskey’s other kin is Rittenhouse Rye, owned by Heaven Hill but contract distilled for them by Brown-Forman at their big Louisville distillery after the devastating 1996 Heaven Hill fire. Rittenhouse is now distilled by Heaven Hill. Like the standard Woodford, this is a combination of Louisville and Versailles distillate. It has some characteristics of both, but I don’t want to read too much into that, since it may be a different recipe(s) from Rittenhouse and the WRMC. It has the caramel and orange of Rittenhouse but also the light spice of the WRMC ryes. Before rye became popular, probably would have dragged this whiskey for being too expensive and boring. In those days one could get beautiful, aged ryes like Rittenhouse or Sazerac for well under $30, but not anymore. Cheap ryes now taste like cheap ryes. Woodford Rye is not exactly thrilling, but it is a good example of the style and it lacks any obvious flaws. In its price range, I would rate Knob Creek Rye (at 100 proof) higher, but this bottle is still a recommendation. Appearance: Bright orange with short legs and necklacing (coloring is allowed in Canadian whisky. Nose: Boiled corn on the cob, cumin, winter savory, hint of leather, new make. Palate: Mild. Lavender, alcohol, multi-grain bread. Finish: grape jelly bean, new make, burn. Mixed: Performs well in an old fashioned and in ginger ale, although it gets a bit lost. Servicable with club soda. Parting words: Canadian Mist is a perfectly adequate, entry level Canadian blend, but not much to write home about. It tastes very young, which it is, and doesn’t have much to offer except grain character with faint whispers of mature characteristics like oak and caramel. If you’re looking for something undemanding to sip with soda or in an old fashioned, Canadian Mist fits the bill. Black Velvet fits the bill just as well but is $2 cheaper. I think you know what I’d do in that situation. Canadian Mist is mildly recommended. Maker: Canadian Mist, Collingwood, Ontario, Canada (Brown-Forman). Style: Blended Canadian finished with toasted maple staves. Nose: Popcorn, butterscotch, cut maple. Palate: Semi-dry with a velvety mouthfeel. Hotter than expected. Maple candy, a bit of grassiness. Finish: Maple syrup, sweet cinnamon. Fades fairly quickly. Mixed: Good in an Old Fashioned and in a cocktail I found called a Ste. Agathe made with triple sec, lemon juice and grenadine but it didn’t hold up in one I tried called an Original (shot of whisky with a teaspoon each of sweet vermouth and grenadine). A cocktail from the Collingwood website called a Collingwood Classic (muddled orange peel, bitters and syrup) was tasty and refreshing. Orange seemed to work well with the rye and maple notes in the whisky. Parting words: “Mellowed” with maple staves in a stainless steel vat after aging, Collingwood is a relatively new addition to the Michigan state list. I’m not sure why that term is used and not finishing or infusing. Mellowing has the potential to confuse consumers who may be more familiar with the mellowing process used by B-F’s cash cow Jack Daniels. Jack Daniels is filtered through a vat filled with maple charcoal after distilling, so there’s beyond the use of maple wood, there’s no similarity. I’m not familiar with Collingwood’s sibling, Canadian Mist, so I can’t make that comparison but Collingwood compares favorably with other Canadians in the $20-$35 range. It’s not as good as Gibson’s Finest, but better than Crown Royal and Forty Creek Barrel Select. Plus the maple finishing adds an extra element that justifies a couple extra bucks. The bottle looks like it should contain aftershave but it does fit easily on a shelf and comes with a built-in pourer like a 175 ml bottle. 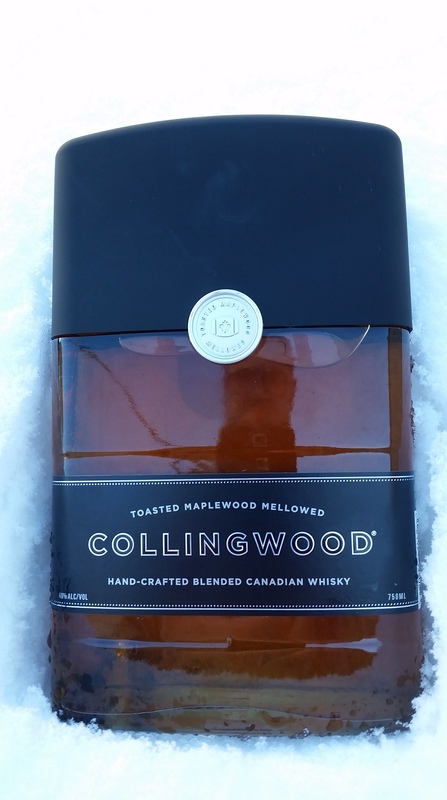 Collingwood works best as a quality mixer or a casual post-supper sipper. Recommended. WR: Copper with thin legs. WRDO: Slightly darker with pronounced necklacing. WR: Alcohol, oak, dried oregano, homemade caramels. WRDO: Leather, oak, black walnut, alcohol. WR: Full bodied and sweet. Burn, brown sugar, a touch of cayenne and not much else. WRDO: Medium bodied and tannic. Alcohol, brown sugar, oak. WR: Sweet and slightly oaky with some candy. Then lots of burn. WRDO: Very oaky. Black walnut, fresh oak, fades into alcohol and then away fairly quickly. Parting words: Woodford Reserve is a popular whipping boy for bourbon enthusiasts. The knocks on it are that it’s young, overpriced, underpowered and its success is all marketing and packaging and no substance. Knocks on the Woodford Reserve Master’s Collection, a series of experimental annual releases have been similar but even more harsh. It’s hard to argue with those points. Woodford is expensive for an NAS of 90 proof with little in the way of distinctive tastes or aromas. Woodford Double Oak, a rebarreled version of Woodford with a strong resemblance to the Seasoned Oak Master’s Collection release, adds some needed oak, but not much in the way of depth, unfortunately. Both fare well in manhattans, but I don’t recall trying them in any other cocktails. When the Double Oak was released, it was a marginal buy at $50 but $60 is an absurd price for what this is. If it sold for $40-$50 it would be worth a full recommendation, but as it is it is mildly recommended. Standard Woodford was overpriced when it first came out, but as bourbon prices have risen around it, it doesn’t seem so bad. Still, it is dull and its sister brand Old Forester is a much better buy and available at 100 proof. Woodford Reserve is also mildly recommended. Our final review from Walloon Lake with Josh, Amy & Jennifer. Enjoy! Appearance: Auburn with thin clingy legs. Nose: Oak, pecan, alcohol, raw almonds, hint of cocoa, touch of wild blackberry. On the palate: Amaretto, caramel, toffee, burn, much less tannic on the palate than in the nose. Finish: Pretty hot and aggressive, but not unpleasant. Caramel, vanilla, dark chocolate, a kiss of oak. Lasts a very long time. Parting words: The Evan Williams Single Barrel series has been going on for quite a while now. While all are single barrel (duh), all the barrels picked are very close to each other in flavor profile so there is usually little variation between bottles from the same “vintage”. This one, the 1998, is one of my favorites. It has a big, woody nose but turns to soft caramel in the mouth, reminiscent of Elijah Craig 12 y/o or some of the Old Forester Birthday Bourbon offerings. There’s a reason for the latter resemblence. In 1996, the old Heaven Hill distillery in Bardstown burnt to the ground in the biggest distillery fire on record in the US. In the spirit of collegiality that Kentucky distillers have for each other, Beam and Brown-Forman helped out Heaven Hill and contract distilled for them while Heaven Hill got its current distillery in Louisville (purchased from Diageo) up to speed. The 1997 vintage was produced by Jim Beam, and the 1998 and 1999 ones were produced by Brown-Forman. This series is easily collectable and very drinkable, especially in the summer time. Not all vintages are particularly interesting, but always good. One of the few drawbacks to them is the low proof. In keeping with other Evan Williams expressions, the single barrel edition is 86 proof (and some change), pretty low for a product like this. Despite the low proof, this vintage still shines as one of the best. 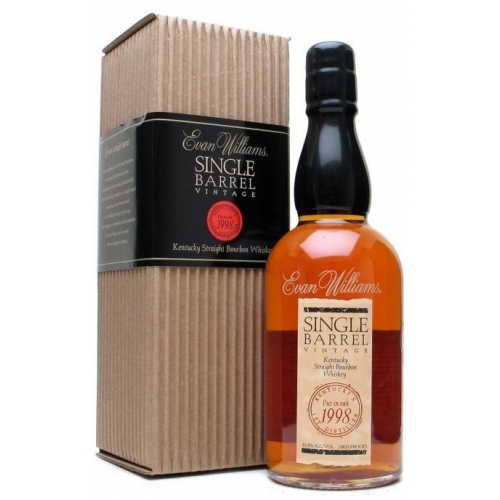 Evan Williams Single Barrel, 1998 Vintage is a very good whiskey and is highly recommended. Appearance: Dark copper with longy clingy legs. On the palate: Thin and surprisingly light on the palate. A litte spice, sweetness and burn. Doesn’t quite live up to the promise of the nose. Finish: The assertive, “dusty” Old Forester notes from the nose come roaring back in the finish. Big burn, then big tannic oak, then a hint of cotton candy. The burn and tannins linger for a very long time, begin to transform into peppermint, and then vanish. Wow. Parting words: Old Forester Birthday Bourbon is always interesting, whatever else it may be year to year. Ironically 2011’s is unusual in its Old Forester-ness. The previous two years were notable for being the least Old Forestery in a while. This one brings to mind old bottles of Old Forester Bottled-in-Bond or a milder version of the Woodford Reserve Master’s Collection Seasoned Oak. The 2011 edition is the best since 2008 and is recommended.